Lizzie Lee is a maker with a mission. She is passionate about re-cycling and makes one-off bags and lampshades using a material she’s developed out of melted-down plastic milk bottles. She’s also keen to spread the re-cycling message to others and runs workshops designed to teach people how to make new things from old materials: ‘It’s a part of the process of changing the way people live and teaching them new skills’, she says. After your foundation course you studied glass at Edinburgh, what made you change direction and study Three Dimensional Craft at Brighton University? I found glass quite frustrating. I loved its translucency and wanted to work with three dimensional shape, but I couldn’t handle the heat, so I changed to doing wood, ceramics, metal and plastics at Brighton. What made you decide to focus on re-cycling? During my degree I took a year out and visited India and that was really a turning point for me. All the waste was so much more visible there and I could see the plastic bottles piling up in the desert. As a traveller you feel particularly responsible for the plastic water bottles as they wouldn’t be necessary if you weren’t there to buy them. And I was also really struck by the way the Indians re-cycled the bottles. The jugs and bottles and buckets they made were so much more colourful than the equivalent at home and looked so much the better for it. When I got back to university I was no longer interested in working in fibre glass (which I had been doing before I left) as I felt that it was so bad for the environment, so I started experimenting with re-cycled materials. What was the first re-cycled material you managed to produce? I spent quite a long time experimenting with milk bottle lids and plastic vegetable bags. I fused them together and then melted them into a flat sheet which I cut out and then wove into another material which I then melted again. To begin with I didn’t know what I was going to use the material for, but after a couple of months I started producing bags. 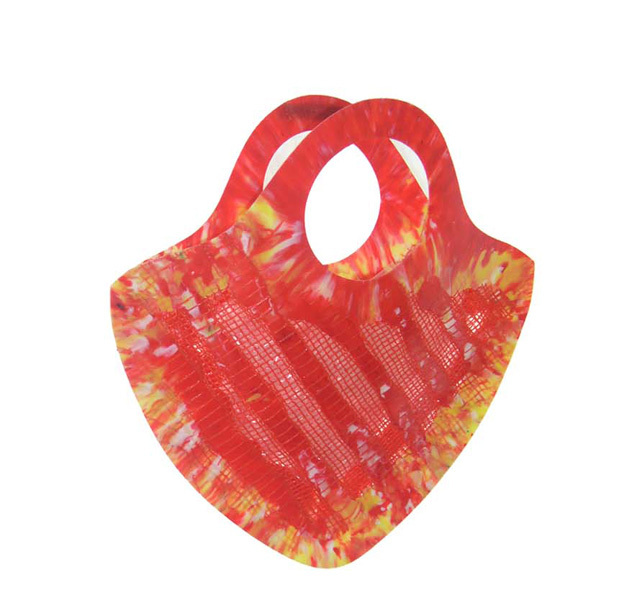 These were inspired by the colourful plastic bags you get in Mexico – and also I wanted to make something functional as I thought it would be easier to sell. Have you developed any other re-cycled materials/products? I have worked out a way of fusing vintage lace with plastic. I collage the individual fragments of lace and net curtains (often sourced from charity shops) together with a sewing machine and then melt plastic milk bottle tops over it using a heat press. 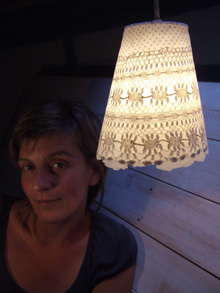 I then stitch the material onto a frame and make it into a lampshade. How important are materials in your work? My work is very materials led. I have always been very interested in experimenting and exploring the properties of different materials. They are definitely my starting point and then once I’ve worked out how to make the material, I think about what I’m going to do with it. 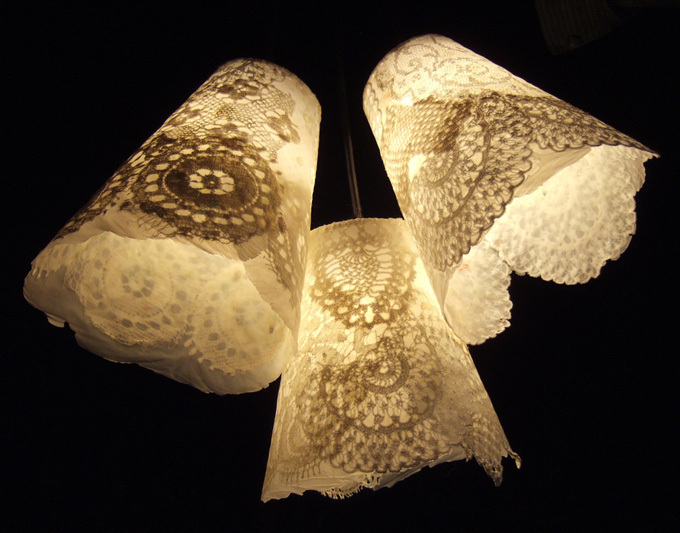 For example, it was only after I had learned to fuse vintage lace and plastic that I realised that this material would make great lampshades as it looked so good against the light. Do you make all your pieces yourself? Yes. It’s really important to me that each piece is handmade and is special – every lampshade is different as every one incorporates a different piece of lace that was once special to someone. I would never want to get them mass-produced. I think what I would really like to do is have people bring me their own pieces of lace – I could then make it into a lampshade which they could enjoy rather than having the lace sitting hidden away in a drawer. It would give the lamp an extra emotional value and mean that the owner would be less likely to throw it away when it went out of fashion – which of course discourages excessive consumerism. Can you explain how your Sock Alien developed? 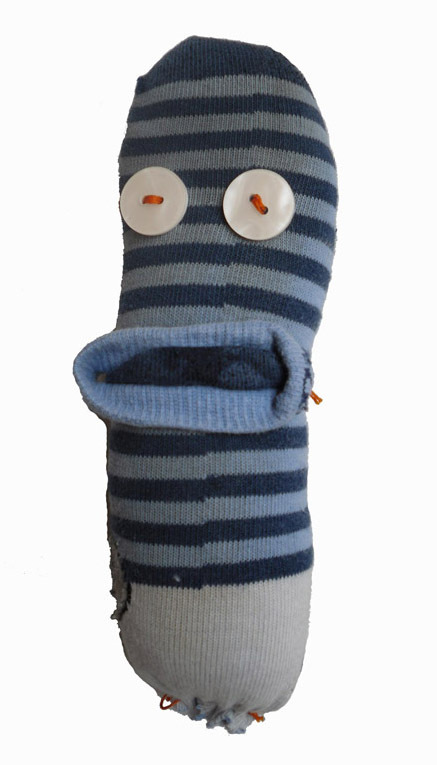 It’s a puppet that came out of my first MA and was intended as a way of showing people how they could re-use materials. I do workshops teaching people how to make similar pieces using old socks and gloves; it’s all part of my interest in working in a more collaborative way and encouraging people to use their creativity and be more resourceful. I want to show people how to make things themselves so they can see the value it adds to an object and also teach children new skills like sewing. The alien bit comes from the fact that no one knows what an alien looks like so that they can make their puppet in any way they like – it makes it more accessible to younger ages and gives everyone a bit more creative freedom. 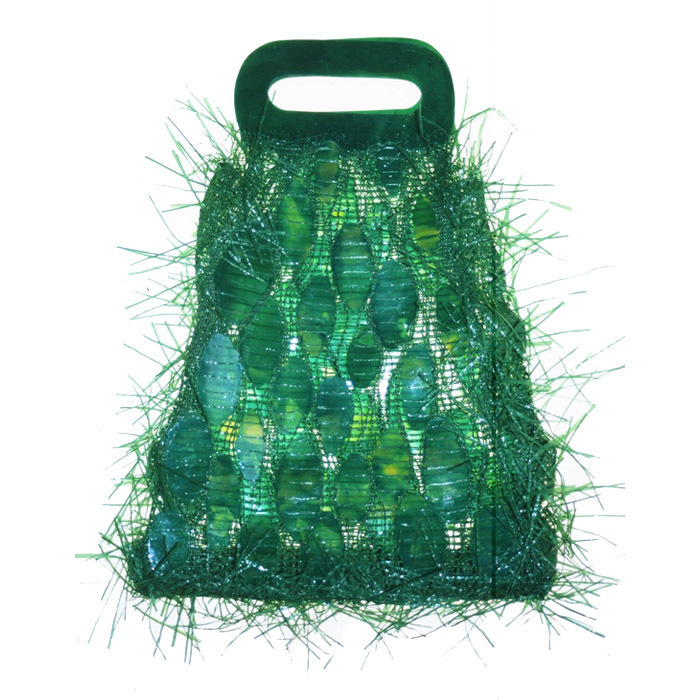 I have just started an MA in Sustainable Design at Brighton University and would like to use it as a chance to explore biodegradable materials like seaweed, blood and sawdust. Blood is such a precious part of an animal and yet it just gets wasted during butchering and so it would be great to use it somehow. In the 1800s the French developed a plastic-like substance using blood and sawdust and I would like to explore this material – I think I would use it to make a statement type of piece rather than a functional object as blood is such a precious material.